The liberal media, from websites like Mother Jones, to cable news outlets like CNN, are understandably concerned at how effective "memes" are becoming for conservatives in communicating an idea or behavior, using an image or GIF, that goes viral spreading from person to person online, often with the aim of conveying a specific theme, or meaning represented by the meme. Recently the leftist website Mother Jones headlined a lengthy piece "The Left Can’t Meme”: How Right-Wing Groups Are Training the Next Generation of Social Media Warriors," with the sub-header "Memes helped elect Donald Trump. Now well-funded conservative groups are using them to proselytize." In that piece the writers describe what they find disturbing about "the coming meme war of 2020." It is that inability to meme effectively on the left that has caused the EU to pass Article 13, to ban memes, as Stefan Stanford recently detailed in an piece titled "Article 13 Offers Proof Globalists Are Terrified Of 'Meme Warfare' In 2020 As EU Enters Orwellian End Game After Draconian Law Sets Up Abolishment Of The 'Free Internet." A little further down in the Mother Jones article they explain that perhaps no one understood the effectiveness of memes better than the former executive chairman of Breitbart, Steve Bannon, who helped president Trump get elected in 2016, pointing out that "In 2016, only 5 percent of Breitbart‘s posts were of images, but those images accounted for half of the site’s most-shared posts on Facebook." As almost any website owner can tell you, when promoting an article or website on social media, when a post is shared with a captivating image, or a meme, it will garner far more "shares" than a post without an image, which is what makes memes so effective. To be able to make a point with an image, communicating a simple idea via a caption or an overlayed image, will make that idea stick in the mind far more than reading a lengthy post, especially if it is humorous. 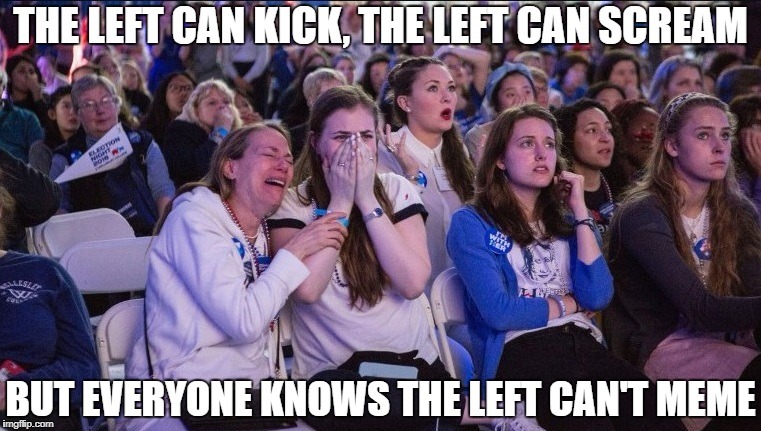 That right there is why "The left can't meme." Everything offends them, they have lost the ability to find humor in most things because they are too busy looking for something that may offend someone, somewhere, because they are so focused on being politically correct and attempting to force everyone else to be politically correct, they have stunted their own sense of humor. Let me provide a recent example: Burger King put out a promotional ad for their new "Vietnamese" burger, where people are seen holding the burger in massively over-sized chopsticks to feed it to another person. The eight second clip shown below. Some found it amusing, some thought it was silly, but liberals..... no, they screamed "racist." In fact one woman was so offended that Huffington Post interviewed her. 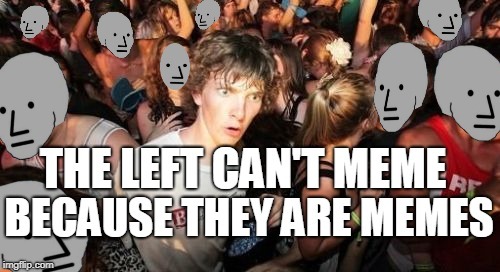 Humor is subjective, something I find amusing may not be another person's cup of tea, so to speak, but to take offense at every little thing, and to make a huge deal out of it, is one of the main reasons why "The left can't meme," and the reason they are so freaked out over the fact that memes have become such effective tools to promote conservative ideology, or just to make a point. CNN's Brian Stelter on his Sunday '[UN]Reliable Sources' show, discussed the "meme wars," asking his guest David Axelrod, if "Democrats understand what they’re up against," after showing a Joe Biden meme created by viral meme maker Carpe Donktum, to which President Trump retweeted on Twitter. Stelter then went on to whine "the right wing media machine is much more effective at this kind of visual communication and the Democrats aren’t even trying." In a matter of hours, Carpe Donktum did it again, this time highlighting Stelter's comments in another two minute video meme, titled "Best Episode of Reliable Sources EVER." Carpe Donktum wasn't done with CNN, as he then tweeted out his latest 30 second meme video, saying "This is @CNN," which instantly went viral on Twitter, with 88.5K views within the first 12 hours. After president Trump retweeted Carpe Donktum's Biden meme video, the New York Times contacted him for an interview and the following paragraph captured my attention. I find this to be the height of irony. The "game changed," not because President Trump retweeted a funny gif, but because the media freaked out over it. 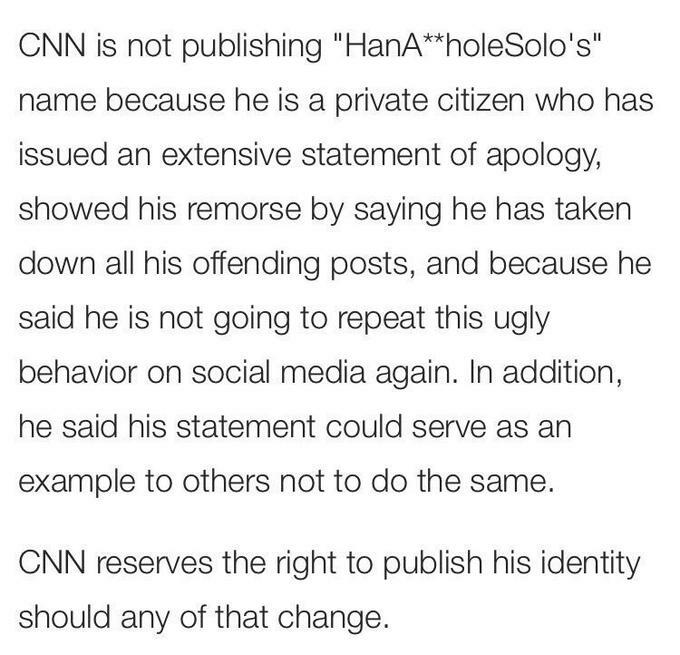 CNN actually hunted down the gif maker, some random Reddit user, then fored him to apologize under the threat of doxxing him (revealing his name), if he repeated his "ugly behavior on social media again," which created a huge CNN scandal, resulting in the hashtag #CNNBlackmail. Conservatives on the Internet raced to create their own memes as a result, dubbed the "great meme war of 2017," basically daring CNN to come after everyone, and as stated in the NYT interview, that was when the game changed. So, the irony here is that it was the media's reaction and subsequent actions that took memes from being just amusing images, and created the political meme wars. One doesn't have to have special equipment, nor technical knowledge to create memes online, there are a number of websites that make it as easy as uploading an image or video of your choice, adding amusing captions that resonates, and boom, you have created a meme that you can then share with family, friends, in comment sections or on social media.One of the easiest meme generators to use is at https://imgflip.com/memegenerator. Everyone can meme, but remember, in order to meme effectively, you must have a sense of humor. Feel free to create some memes, share them in the comment section, or just find your favorites online and share those.